This past week was my birthday, and I share it with fellow Zontians Pat Kosley and Phyllis Zell. In light of the Columbia tragedy, we all remember that life is precious. Here I want to share thoughts for staying young, paraphrased from a short article by Anita Esway. Throw out nonessential numbers. This includes age, weight and height. Let the doctor worry about them - that's why you pay him/her. The tears happen. Endure, grieve, and move on. Be alive while you are alive. Surround yourself with what you love - whether it is family, pets, keepsakes, music, plants, hobbies, whatever. Your home is your refuge. Don't take guilt trips. Go to the mall, the next county, a foreign country, but not to guilt country. Tell the people you love, that you love them. "...I am grateful to all of you. 9. The difference between cream, ivory and off-white. 5. Why discovering a designer dress on the clearance rack can be considered a peak life experience. 1. OTHER WOMEN, ESPECIALLY ZONTIANS!!!! Isn't it great to be a woman? You are all beautiful, intelligent, talented, charming, and hilarious women in my life, and I am grateful to all of you. ZONTIANS ARE THE BEST! Ava Heinrichsdorf called to tell me how thrilled she is with the wonderful biography of her in the last newsletter. Great job, Patty, you're off to a great start! We look forward to many more interesting articles, now that you're an accomplished writer of letters to the editor. . . . Please call Ava to wish her well - she9s dealing with a painful back problem and hoping to avoid surgery. Mark your calendars! I called Rebuilding Together and we're all set for the Saturday, April 26 workday. Kate, Pam, Teri, Pat and Helen signed up already, but there's room for more. Stay tuned for details. We'll signup at the next meeting. Thanks to Teri, Shannon, Susie, Rita, Phyllis and Pam who contributed to the raffle basket for the Area Meeting. The amount of clothing donated for Dress For Success was overwhelming. You are all so generous! "The quiet that envelops space makes the beauty even more powerful. And I only hope that the quiet can one day spread to my country." 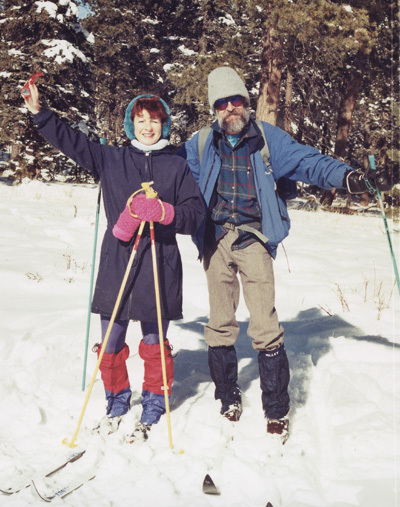 Eva enjoying the Colorado winter with husband, Rick! Buy grocery certificates and earn money for our service projects! Gail Piper will be coordinating this fund raiser which will be on-going. Please contact Gail (e-mail or phone) and order your Safeway and King Soopers certificates. It is a $-for-$ exchange so does not cost you extra, yet our club will get a percentage of the total dollars for our projects. There is a $200 minimum so get a partner if you want to share that amount. If you contact Gail prior to the next meeting, we may get this project off the ground in March! Buy certificates! Roses available from Pam Sufak. Place your orders no later than March 10th. Long stem yellow roses - $1.25 each - will be delivered to the March 17th meeting. Gift cards available. Excellent gift for those women who support our members and our projects. Call or e-mail Pam! Zonta would like to welcome new member Ellen Slavitz. Ellen, a member of the Mayor's Global Advisory Council, has already helped our Zonta chapter become more recognized in Colorado Springs as being an international organization with Zonta's application for awards, listing and participation in their International Awards Luncheon at the Broadmoor in January. Thanks, Ellen. Ellen has a Masters in International and Intercultural Communication. She is very busy with her own business as a book indexer, an English composition instructor and is also a student in Adult Learning, Training and Development. She enjoys biking and other outdoor activities, healthy cooking, dancing, listening to (and singing) jazz. She is involved in other internationally-oriented groups, but appreciates that Zonta is for and about women. As with all who are self-employed, Ellen appreciates that Zonta gets her out of the house to work with women with a range of interests and backgrounds and, also, shows her how a self-sufficient international organization functions. She says she enjoys people who have made interesting and original choices in their lives and those with self-awareness and "emotional intelligence". Ellen, we appreciate your sharing your expertise, interests and experience with our Zonta chapter. NEW! Member Profiles and Spotlights - "Re-Prints"
Betty for participation at the Globalization Conference. Rita, Ellen, Patty, Earlene, and Janet for representing us at the first mayor's international luncheon. Kris for putting together the raffle basket. Betty for having so much Zonta enthusiasm! Earlene for suggesting grocery certificates as a fund raiser. Pam for ordering yellow roses for International Women's Day! Marion House needs supplies for women. Please save hotel soaps, shampoos and other items for use there plus feminine products, underwear and socks. Bring to next general meeting and give to Kris, Shannon, Susie or Pam for delivery. I am doing very well this year at the Colorado College. I have recently applied for the Watson Fellowship. The Watson Fellowship is a scholarship for college seniors to do a project of their own devising for one year in a foreign country, immediately after graduation. I have attached my proposal so you can get a sense of what I am interested in studying and what I would be doing for my Watson year if I receive this award. Thank you all for your help and support over these years. Reminder: Clothing may be delivered to Dress for Success on the 1st Saturday of every month 10am - 2pm.